We are excited to announce that the first three badges have been released so you can start working towards earning those. Remember, the badges are supposed to be rare and difficult to achieve. It is highly unlikely that anyone will be able to earn all, or even most of, the badges. The first badge is the 'Sermon on the Mount' badge. As you can probably guess, this badge is awarded once you have memorized Matthew 5-7. The second badge is the 'Consistency' badge which will be awarded to people who consistently complete their memorization sessions. To earn a gold badge you will need to complete 350 memorization sessions in a year. The silver badge will require 320 and the bronze badge 280. The final badge is the 'Referrer' badge and is awarded to those people who have done a stellar job spreading the word about Memverse. You need to have 200, 100, and 50 active referrals to earn that badge. The badges are awarded when you complete a memorization session or when you visit the 'My Progress' page. At the moment we have it set so that you won't ever lose a badge once you've earned it. A huge thank you to Dakota Lynch for designing the badges. I think he did an absolutely brilliant job! Finally, we would love to hear more ideas for badges. Our plan is to keep releasing new badges over time. Those of you who have an iPad 3 should try out the voice dictation. I tried it a few days ago and, despite some difficulties with my other-wordly accent, it was relatively effective. I think over time it will only get better and I look forward to the day when typing out one's memory verses is just one of the alternatives. I have been having some trouble memorizing Romans 8 so have been trying out a variety of tactics to break the logjam. I've recorded myself reciting the chapter and use my phone to listen to it when I have 5 minutes of down time. I also wrote it out by hand a few nights ago and found that very useful. But I found that there is nothing like slowly dictating it to really get it stuck in my head. I would encourage everyone to use as many different techniques for memorizing the Bible as you can lay your hands on. The more variety you incorporate, the more likely you are to persist with your memorization and the quicker your memory verses will become lodged in your mind and heart. A foreshadowing of an upcoming feature: we will soon be releasing the first Memverse badges. This would be a good time to be consistent, promotional, and gospel-minded. If Christ holds the universe together by the Word of his power, why would we think it takes anything less to hold a family together? And even if Christian families know that only God's grace can make them effective as an embassy for Christ, are Christian families in the Word together and in prayer together to make their embassy vision a practical reality? Learning to live as ambassadors of Christ is a life-long pursuit. As long as we're on earth, our mission is to "make disciples of all nations" (Matthew 28:19). Discipleship doesn't end with the family, but it does start there. Parents, particularly fathers, are instructed to bring their children up in the discipline and instruction of the Lord (Ephesians 6:4). No matter where you are in life, I hope that you see the significance of the Christian family and the importance of helping families — not only our own, but also others — grow in the grace of God through the Word of God. As I think about parents discipling their children, I think about the 2012 National Bible Bee. My favorite feature of this year's program is that there will "only" be two verse cards per week and approximately twenty minutes of planned Bible study per day. There are less verses over the summer than in years past. But I think the principle of "less is more" may prove true here: With less verses to memorize, there is more time to meditate. More families — really all families — can have a structured time for family discipleship through the Bible Bee, memorizing Scripture, praying together, and studying the Bible. Parents using the Bible Bee as a tool to disciple their children. You can learn more about that on the Bible Bee's homepage — they have a nice overview of the program this year. Local churches and other ministries hosting a Bible Bee. More hosts are needed to enable more families to participate. To learn about what hosting entails, you can click here. Volunteers helping to host a local Bee. Donors who believe that investing financially in the Bible Bee is a wise use of God's resources. Again, the Bible Bee has a great website which you can visit to register now or learn more: www.BibleBee.org. It’s been nearly two years now since I joined Memverse and I’m always amazed when I consider the many improvements that have taken place since I signed up in the spring of 2010. For starters, does anybody remember the old, tri-color layout that was replaced back in May? Our membership levels had recently dropped to around 550 active users - a number which immediately skyrocketed and nearly hit 1,000 in only a single month. We’ve since continued to achieve record numbers and are currently hovering somewhere around 1,500 users with more than 142,000 total verses memorized! Of course many new features have also been implemented, a few of which include the ability to skip verses not necessarily due for review (>>), tag your verses, search the Bible, track your referrals, select a primary translation, mark verses as Pending, and reset your schedule. None of this was possible when I first signed up, meaning that, if Romans 12:2 was due for review, then so was Romans 12:3-21. Falling behind in your memorization was not easily fixed with the click of a button and the Group Leaderboard was nonexistent. As I have often said, I truly believe Memverse to be the most powerful tool available to help you effectively and efficiently memorize Scripture. I believed that two years ago when five memory verses put you on the Leaderboard, and am even more convinced now than ever that you won’t find a better piece of technology out there to help you get the Word of God in your heart and keep it there. Although Memverse is easily worth a paid subscription, it has graciously been made available free of charge and, as a result, has helped plant the good seed of God’s Word in numerous hearts all across the world. It’s impact has been eternal in my life and is a blessing I thank God for. You will notice that we have added auto-complete functionality to the tagging of verses. I think this will go a long way towards improving the tag cloud by eliminating spelling mistakes. As part of that process we have reset the tag cloud. It will rebuild itself very quickly as people continue to tag their memory verses. Please don't spoil it by typing in silly tags. This is also a great time to clear out some old, misspelled, or unused tags. I'm very excited to announce that this feature was implemented by the newest developer to join our small, but trusty, team: Josiah. Please congratulate him and shower him with requests for changes and extensions! We have made sweeping changes to the page where you add memory verses. Looking back, I'm not too sure what we were thinking with the old design. We took a lot of the enhancements we made to the 'Getting Started' page and incorporated those into the new page. You should find it faster, cleaner, and more intuitive. You can now search for verses by entering keywords (e.g. 'make every effort'), single verses (e.g. John 3:16), passages (e.g. Matthew 5:3-10) or chapters (e.g. Romans 8). One bit of functionality that was lost along the way is support for entering references in other languages. We will hopefully have that back up and running soon. Also, if you need to switch to a different translation, just click on the translation to change it. Hi everyone! The start of 2012 sure has gone by quickly. We are now past January, the month of resolutions, and Feburary, the month of fraying resolutions. If 2012 saw you resolving to add to your stockpile of memory verses, now is a good time to renew that resolution! Many of the changes we've made to Memverse in the first two months would have gone largely unnoticed to those of you who joined before the end of 2011. The start of this year saw us making some changes to simplify the first few minutes of the Memverse experience. We had noticed that 1/4 of the people who signed up never added a single verse. Another 1/4 would complete one memorization session and never come back. Since we know that you're all hard at work referring people in order to advance in your levels, this state of affairs was tragic. We suspected that over the years complexity had accreted like barnacles on a ship, so we set to work simplifying the startup experience. Only new users will see these changes but we're happy with the early signs. Now, more than 90% of the people who sign up add some verses to their account. Over time, we will be merging some of these changes into the 'Add Verse' page. If any of you happen to be looking over the shoulder of someone who is brand new to Memverse we would love to get feedback. What confused or puzzled them? What caused them to throw up their hands in despair and stomp out of the room muttering: "Where are my flash cards? Now I know why the Law was delivered on stone tablets and not via a browser!" ? Second, we have added some more levels for those of you who just can't level up quickly enough. We promise to add more variety over time. Alongside the standard progression system, we will be gradually adding some 'badges'. There will be more to come on this topic but the first ones will probably be awarded for consistency in completed sessions. Most badges will have 3 levels (bronze, silver, gold). We are looking for someone to design some fun badges so if you have an artistic bent we would love to hear from you. We would love to have the badges designed by members of the Memverse community so try your hand at designing a set of 'Consistency' badges. (The badge dimensions should be 120 x 120 pixels and can be either round or square.) If you know someone who is a brilliant graphic designer, please ask them to help out. Andy Johnson has written a great blog post on nine benefits of Scripture memorization. We couldn't agree more! What we like most about his post, though, is his point that memorizing the Bible is a discipline that should be carried on into adulthood. Little warms our hearts as much as seeing entire families memorizing together. From pre-schooler to senior citizen, these benefits transcend age or level of spiritual maturity ... the benefits of hiding God’s Word in one’s heart clobbers the initial difficulties. Nothing will convince children more of the value of memorization as a discipline than seeing it practised by their parents. We know that this is true of so many character traits, but I would suggest that it is doubly true in the case of scripture memorization. Not only will children learn by copying what they see you do, but the mind-transforming discipline of memorization on your own life will make children even more inclined to follow in your footsteps. Kids, if your parents aren't memorizing the Bible alongside you, ask them why not! Challenge them to join you. It's never too late to start. I can still remember when God first used Galatians 2:20 to open my eyes to my sinfulness and need of an authentic transforming saving faith and new Life in Jesus Christ. Immediately God also gave me a conviction that the Bible truly was His Word for us and worth devoting ourselves to in our pursuit of knowing, pleasing, loving, serving, worshipping, trusting, and obeying Him. I couldn't wait to connect with other Christians whose eyes had also been supernaturally opened and who shared my passion for the Scripture. Rather than running into many other mature Christians who had already been passionately diving into Scripture who could inspire and guide me, it almost seemed like NO ONE else was interested in knowing the Bible more than they already did, or much less, even considering memorizing or deeply diving into Scripture. Where was Memverse back in 1990 when I needed some encouragement and wanted to know I was not the only one in the world who thought the Bible was worth memorizing? I absolutely love how we on Memverse can get instant encouragement, support, inspiration and often practical tips to help us with whatever we are memorizing or want to memorize. Currently there are people on Memverse memorizing ROMANS, 1 PETER, 2 PETER, "Elijah", and the One Year New Testament Challenge of one key verse from every chapter in the NT. There is also a growing group who has committed to trying to memorize the entire Bible in their lifetime. This blog is devoted to those who have other Scripture memory projects going on, are considering Scripture memory projects or goals they want encouragement for, or would like more information about other Scripture memory groups available. Please do not use Memverse or this blog as a substitute for the joy and reward of finding or praying for face to face Scripture memory partners. Why not pray for the best of both!! To have a face to face group memorizing and discussing with you while inspiring, encouraging and being encouraged and inspired by other individuals and maybe even other face to face groups around the world who are memorizing the same Scripture you are. With our "Our God has Spoken" Scripture ministries representative Angie Metran and Fountain of Life both promoting Scripture memory big in the Philippines; I and my wife Jacky now promoting a passion for Scripture in Indonesia; and our good friend Hannah Garcia promoting a love for Scripture (though not yet on Memverse) in Zambia, I am more excited than ever in seeing God get all the glory and His Word being honored around the world. Will anyone pray with me that one day we will have passionate, Scripture loving partners in every country of the world? I heard a rumor that a Memverse member is considering memorizing PSALMS. What are you memorizing, or wanting to memorize? Alex's prior blog post on the importance of memorizing from the gospels rang especially true for me. It always seems easier to memorize from the epistles because they contain pithy summaries of the Christian faith; or from the Old Testament because it is rich in poetry and powerful, unambiguous statements from the LORD and his prophets. The narrative, parabolic content of the gospels often seems less worthwhile memorizing because one has to commit an entire story to memory. Why memorize an entire story that appears to only make a single point? Why memorize the parables when we can memorize Paul's digested conclusion in an epistle? I'm currently reading the 2nd volume in N.T. Wright's series, Jesus and the Victory of God. I highly recommend this series. Those of you who have followed the public debate between John Piper and N.T. Wright might harbor some reservations about Wright's theology. I, for one, have been both impressed by the civil tone of their debate and distressed at my inability to fully grasp their differences. While you might not agree with every point that N.T. Wright makes, I can assure you that your understanding of Jesus will be tremendously advanced by following his carefully constructed arguments. Even the introductory sections on how we have arrived at our current thinking about Jesus is illuminating and worth grappling with. I had never realized how influential the Jesus Seminar really was, or how much the theologians in their ivory towers shape our theology. How does this relate to the value of memorizing the gospels? I would contend that to fully appreciate the nuances of Wright's argument for understanding Jesus in a distinctly Jewish context, it is critical, or at least exceptionally helpful, to have some portion of the gospels memorized. When I came to the section in his book on the Sermon on the Mount, my understanding was greatly increased by having the complete sermon in my head. Memorizing the Sermon on the Mount inevitably requires starting with the structure of the sermon. As I memorized Matthew 5-7, I began to wonder why it began with the Beatitudes? Why does it end with the parable about the 'house on the rock"? What should we make of the selection of the six antitheses early in the sermon? Reading his commentary on the other parts of the gospels made me regret not spending more time memorizing and reflecting on the gospels. Over the past 50 years there has been so much disagreement as to who Jesus was and what his aims and beliefs were, that many of us have retreated to the epistles for our understanding of theology. Reading Wright has renewed my appreciation for the incredible continuity between the Old Testament, the gospels, and the epistles. If the thought of reading four 700 page books is daunting, you might want to start with Simply Jesus, Wright's latest book which distills his many years of thinking about Jesus into 250 pages. I haven't yet read it, but intend to. John Piper has written a great response to one aspect of N.T Wright's thinking: justification. The book, The Future of Justification: A Response to N.T. Wright is also available for free PDF download. If you would like to understand what the brouhaha is about, I would recommend reading both books. Whichever side you find yourself agreeing with more, you will probably learn a lot from both of them. The purpose of this post is to reinforce the value of bible memorization coupled with deep bible study and broad reading. Those who know me will attest to my love of good-spirited debate as a means to get closer to the truth but, in this case, my primary point is that memorizing the Bible facilitates our understanding of theology and, ultimately, its application to our lives. Have any of you read Jesus and the Victory of God or Simply Jesus? I'd love to hear your thoughts in the comments. Since the New Year, I've noticed many memverse users setting and sharing memorization goals they would like to achieve in 2012. I myself haven't been one to set many New Year's resolutions in the past, but this year I decided one might be in order since I've slacked off recently in learning new verses. Even though I'm not nearly as skilled in programming as Andy and Alex are, I thought it would be helpful to have an easy-to-read workbook that lets me know if I'm on track to reach my goal – and since I know my way around Excel, I spent today making that happen. Not only does this program tell me how many verses per day I should memorize, but it even lets me know exactly how long it will take me to achieve what I've set my sights on at my current pace! How many verses have you already memorized? How many new verses would you like to memorize? By what date would you like to be finished? Once you’ve completed this initial interview, all you have to do is come back periodically and input how many verses you’ve since memorized. This tells the computer how many verses per day you’re averaging and whether that is enough to reach your goal within the desired timeframe. Once you’ve been doing this for a couple weeks, you’ll even be able to see a fairly accurate prediction of the exact day it is you’ll cross the finish line! Of course anything this complex carries the potential have a few bugs, so the first few of you to download this can consider yourselves the “beta group” despite my best efforts to make sure everything is in working order prior to this post. If ever you encounter a glitch or mathematical error, feel free to comment and let me know. NOTE: This workbook requires the enabling of macros on your PC. If they are not already allowed on your machine, follow the instructions in this tutorial. After clicking the "Get it Now" link, choose "Download" in the upper, right-hand corner of your screen. We need the gospels because we need the gospel. In the gospels we have the clearest picture of the incarnate Word who is himself good news for Adam’s race. And by memorizing and meditating on the gospels we can have a Christ-centered perspective on the rest of Scripture. We are like the disciples on the road to Emmaus, foolish and slow of heart to believe all the prophets have spoken, slow to realize that all Scripture is really about Christ (Luke 22:13-35, esp. 22:27; also John 5:39-40). By starting with the gospels, we gain the perspective essential for profitably meditating on all other verses. If we meditate on the gospels, Christ himself will put the rest of our memorization in its proper place and give us a Christian perspective on the Bible. He will warn us that eternal life is not in the Scriptures or in knowing the Scriptures (see Matthew 7, John 5:39-40) but in him alone (John 14:6, John 17:3). He will remind us that the Holy Spirit is the helper who teaches us all things and brings to our remembrance all that he has said (John 14:26). I realized that I have a tendency to elevate the epistles over the gospels when I read a quote from J. I. Packer, which you can also read here. I need to know Christ better in the gospels, as well as the rest of Scripture. We need balance in our Bible reading, studying, and memorization; and we need a Christ-centered, Christian perspective on all of Scripture. May God open our eyes to see that the written Word centers on the grace and truth of Jesus Christ, who is the Word made flesh (John 1:14-17). Do you have a portion of Scripture that you feel you need to spend more time memorizing and meditating on? We have a new "God Has Spoken" flyer available for download here. I encourage you to take a look at it and print some copies to share! January is always a great time to invite people to Memverse. Everyone is making a fresh start for the new year and there is a lot of excitement about memorizing scripture. Thanks to Emeka Rajis for doing an amazing job on the flyer design! Thanks to Phil Walker for all the work he has been doing on the Elijah Project, and thanks to Ben for helping me compile the audio files. The diligent Elijah memorizers are inspiring. Keep it up! Well, we missed our Christmas blog post and have almost missed our New Year one too! We trust, though, that everyone had a blessed and merry Christmas and quality time to reflect on the birth of Christ. The passage of two thousand years has not dimmed the significance of God sending his own son into the world. As you think about your goals for 2012, consider setting yourself a memorization goal. In an upcoming release we will make it easier to see how many memorization sessions you have completed this year. 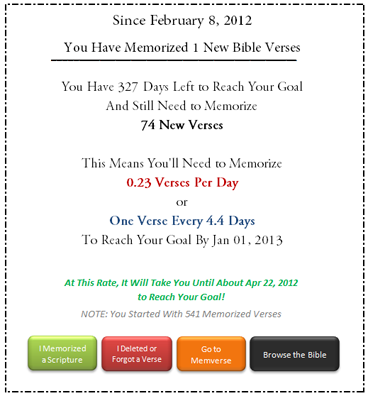 Since it's difficult to know exactly how many verses it's possible to commit to memory in 366 days, consider setting a goal of completed memorization session. My personal goal is 250 sessions, or five per week. Let us know in the comments what your goal for 2012 is. Make it attainable. Finally, a sequence of events over Christmas reminded me again of the importance of coupling memorizing with understanding. We continue to feel that memorizing Bible verses is most valuable when it is a discipline combined with a deep study of the meaning behind the word. Read Proverbs 2 for details. Even if you are memorizing select verses from a passage, please make it a habit to read and understand the full context. If you're memorizing Matthew 2:11, more than memorizing which three gifts the Magi gave Jesus, it is important to understand why Matthew includes this account in his gospel. What does this tell us about Jesus' message to first century Jews? How does it introduce a major theme of Matthew's gospel? What light does this shed on Jesus' cleansing of the temple? How does this inform our eschatology? Combining your Bible memorization with deep study will give you a much richer understanding of the King we serve. We look forward to hearing from you on December 31st, 2012. Memorize with a friend. Find support in a group. Be encouraged by the global church.